Katherine Douglas, 28 is a member of the British Rowing women’s eight competing at the World Rowing Championships in Sarasota next week. Despite her father’s ambitions for her to become a tennis player, Douglas started her early athletic career in track and field in her native Scotland. She was spotted by a rowing coach at a freshers sports fair in her first year at Oxford Brookes University. After successes at Henley Women’s Regatta, BUCS and EUSA, Douglas and her four established the OBUBC women’s squad as serious contenders. Douglas subsequently moved to Leander Club and despite set-backs and injury has represented Great Britain at both U23 and senior level. No one likes long sessions on the erg but they’re the whole base of the pyramid so we have to do them to build a solid base for the season. But it’s boring erging for well over an hour. One thing you miss being a rower. I seriously miss being able to run for pleasure. I grew up running and sometimes it’s just great to hit the streets and clear your head. Some days I might have done weights session and a session in the boat and I still feel the need to get my shoes on. I find it hard to conserve energy because it’s not just about running – it’s about clearing my head and being alone for a while, running is a great way of gaining perspective. What’s your favourite non-training day meal? Well at home in Scotland it would be haggis with neaps and tatties! But in Henley it has to be fish and chips by the river. Not a lot to be honest. My friends are great as they cook for me. I eat at Leander or at Caversham which is one of the perks of being in the squad. If you opened my fridge today you would probably only find a mouldy block of cheese Bright Jones-style. 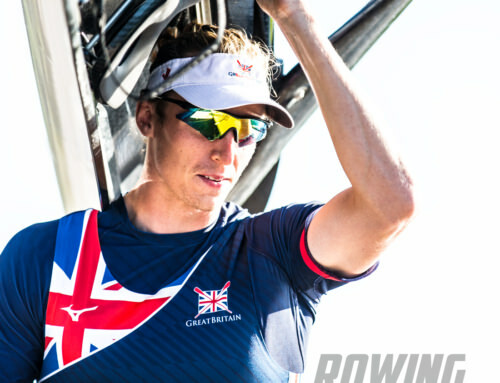 What is the most important piece of advice you could give young rowers coming into the sport? I think you’ve got to keep it fun. If you take it so seriously the whole time, it just becomes draining, like a chore and you won’t enjoy it. Whereas if you keep it fun and keep it light and always have a bit of a joke when you can, it’s just a much more enjoyable sport. Probably developing more thinking space before speaking! I tend to be very vocal about my opinions and the way I feel about things. I would like to be a bit cooler on that front but I am very passionate about what I do so it’s sometimes hard to control my enthusiasm. But yes, just making time for a pause. What are your favourite hacks to maximize your sleep? I’m a very bad sleeper. I’ve had the whole sleep hygiene talk plenty of times. Staying off your phone, listen to Headspace, lots of books, having a hot bath to raise your temperature and lower your temperature and all that. I nap a lot between training which I find quite easy so I catch up that way. Katrín Davíðsdóttir, she is an Icelandic athlete and won the Crossfit Games a couple of times. She is an immense athlete and I love her disciplined approach to training and nutrition. Not really. I normally just put my headphones and just have a few minutes to myself and just try and get everything in order, go through the race in my head. I kind of get real quiet, which almost like freaks a few of my crew mates out. Some of them usually ask if I’m OK as they are not used to me being like that but it’s good to get calm and focussed before competing. I would want it to say “The wolves at the bottom of the hill are always hungrier than the wolves at the top”. A friend told me that when I was trying to get back into the squad and it’s constantly in my head. So if you’re struggling to get where you want to go then just remember that the people at the bottom of the hill are often more motivated than those at the top.